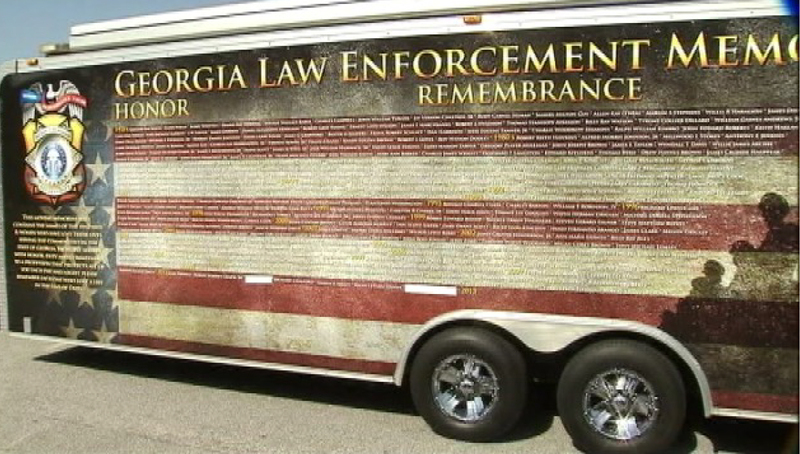 The Georgia Law Enforcement Memorial Wall will be coming to the Griffin Police Department in honor of Officer Kevin Jordan, who was killed in the line of duty May 31, 2014. In honor of fallen Griffin Police Officer Kevin Jordan, the Georgia Law Enforcement Memorial Wall will on April 21 arrive in Griffin. The wall will be escorted to the Griffin Police Department by the Blue Knights Motorcycle and is expected to arrive at approximately 9 a.m.
Jordan, who was killed in the line of duty May 31, 2014, will be honored with a brief ceremony. The ceremony will begin at approximately 10 a.m. and will conclude with the unveiling of Jordan’s name on the wall. The Law Enforcement Memorial Wall will remain at the Griffin Police Department for a portion of the day before being transported to its next scheduled location.